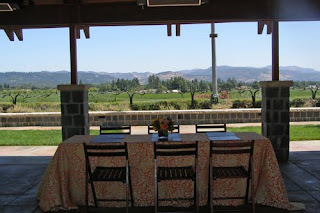 I knew I didn’t have nearly enough time in Napa as I’d like, so it was difficult to narrow down where I was going and what I would miss this trip. After a full day – with the help of Steve, my wonderful driver from Pure Luxury Transportation – I think I accomplished quite a bit. 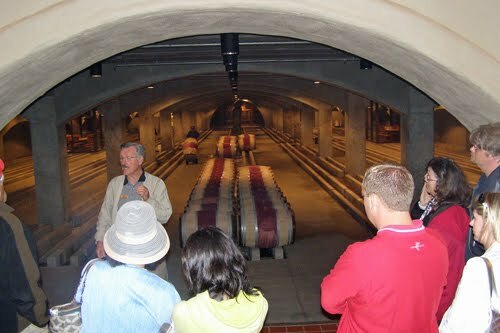 The first stop for the day was at Robert Mondavi. The Spanish architecture of one of the oldest and largest wineries in the area is welcoming as Dean takes me through the vineyard, warehouses and buildings that were once the center of culinary excellence as well as wine making. 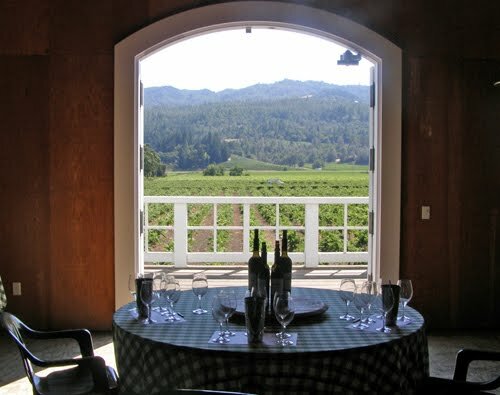 Mondavi hosted the “Great Chefs Program,” with notables like Julia Child cooking on these premises. It was the patriarch’s dream to combine food and wine and it has been continued with food events like the Garden to Table Brunch. Despite all the talk of great food and gardens full of herbs and vegetables, it is wine I am at Robert Mondavi’s for and we make our way into a tasting room. It is in this winery that the Fume Blanc, a drier Sauvignon Blanc, was invented. Even though I personally wouldn’t want anyone to dry out my Sauvignon Blanc, I had to appreciate the longer length of the short barreled (six months) Fume Blanc ’08. Among the other wines we tasted, the Napa Valley Cabernet Sauvignon Reserve ’06 stood out, a smooth wine with full tannins. Before heading to the next winery, Steve took me over to Oakville Grocery, a small store-deli filled with treats, cheeses and sauces. I couldn’t resist what they called their famous Peanut Butter Cookie and felt it was perfect to hold me through at least one more tasting. That was at Flora Springs, where Travis greeted me with a delicious 2009 Oakville Sauvignon Blanc. It had strong pineapple notes and I was satisfied, but Flora Springs had much more to offer, including some offerings unusual for Napa from this family-owned winery, like Sangiovese, a Chianti style wine that is a bit of a cross between a Cab and a Pinot Noir. There was also a Pinot Grigio from ’09, a very good vintage with strong citrus notes, and the winery’s flagship wine, Trilogy, which is 75% Cabernet, blended with Merlot, Malbec and Cab Franc. After a tour through the wine cave and grounds of Flora Springs, which included a look at the fruit trees that help produce wine club extra treats like Apple Butter and Fig Balsamic Vinegar, Travis suggested I stop by Dean & Deluca’s to pick up a little lunch to enjoy at Flora Spring’s tasting room next door to there. 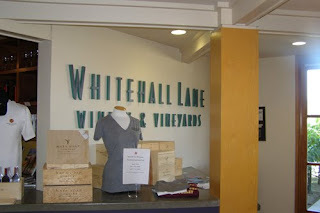 He called ahead so there was a cold glass of Sauvignon Blanc waiting for me and I enjoyed the wine, salads and baguette overlooking the valley for a half hour before Steve beckoned me into the car and off to Whitehall Lane. My final winery of the day was a real treat that wasn’t on the original schedule. Cathy Corison had seen my Twitter message that I was coming to Napa and asked that I stop by Corison Winery so I had her slated in at the end of the day. Despite the fact that she was a last minute addition, this winery owner was quite a gracious host. She led me to the top floor, where a beautiful table of glasses, cheese and fruit overlooked a picturesque window showing the vineyards. Cathy Corison and her husband had bought this property in 1995 and had built quite a reputation making great Cabernet (though I was also impressed with the Gewurztraminer). As I learned more about how the Corisons built up this small winery, we did a vertical tasting of her Cabs from six years. We were both in agreement that the 2002, with its light spice, oak and vanilla, was the favorite, with the 2004 Corison Cabernet Sauvignon the richest of the group. I ended my day as it began, at Bardessono Hotel. I had checked into the Harvest Inn for the night, but Bardessono invited me back for dinner since I was already booked at étoile the previous night. The chef actually went out of his way to create a tasting menu just for me, altering the foods that didn’t work with my allergies and using the freshest herbs and vegetables from the hotel’s garden. The melon soup with olive oil was excellent; the eggplant salad with avocado perfectly combining two of my favorites; the prosciutto and figs a wonderful sweet and salty combination; the trophy pasta with basil and truffles tasted as good as it smelled; and the peach melba dessert with almonds, vanilla ice cream, mint and raspberry sauce was fresh, fruity and delicious. The only thing that was not completely to my liking at dinner was the Clunky Chicken, served with a corn mixture, but it worked out alright since I needed to save some appetite for another full day to come of Napa Valley eating and drinking.